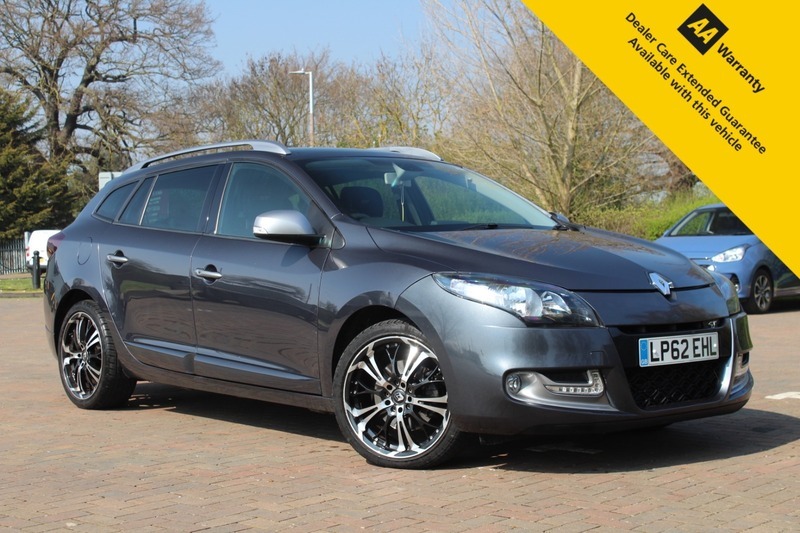 Here for sale at Leigh Cars Ltd we are delighted to present this impressive RARE LOW MILEAGE TOP SPEC Renault Megane 2.0 GT Line Tom Tom Dci Sports Tourer finished in brilliant metallic grey paint. The GT Line Tom Tom model comes with an unrivalled specification list including electric windows and mirrors, climate control, auto lights + wipers, cruise control, bluetooth connectivity, sat nav, rear parking camera, renault sports chassis, alloy wheels + so much more. This particular example also comes with a £800 upgraded panoramic glass sunroof with electric sunblind. This beautiful example has a SUPERB FULLY STAMPED MAIN DEALER RENAULT SERVICE HISTORY - 4 stamps in total - last serviced at 43k. It also comes with a LONG MOT - EXPIRY DECEMBER 2019. This fine example is in beautiful condition inside and out and has been maintained very well. This car is perfect for a growing family or maybe someone looking for a fantastic low mileage sports tourer estate with an abundance of specification and practicality as well as a truly awesome drive. This car will only cost £155 per year to tax and will return you an average of 50.4mpg, so is nice and economical to run for a bigger estate vehicle. it truly is a SUPERB DRIVE and we would strongly recommend a test drive, so what are you waiting for? BOOK YOUR TEST DRIVE IN TODAY!